I was in the middle of giving Mama last minute details of our camp site, just in case she needed to call Search & Rescue, when I lost her. “Welp. We’re on our own now.” I said to Andrew as I set down my phone. I found myself habitually checking it every few minutes, you know, just cause. What was I looking for? I don’t know! A new “Like?” More affirmation from my phone? Here I am surrounded by vast, glorious, endless, beauty – yet I’m chained to a 2×5 screen. We got off on a dirt road entering Bridger National Forest, and with each bend in the road, the layers of the city began to melt away. 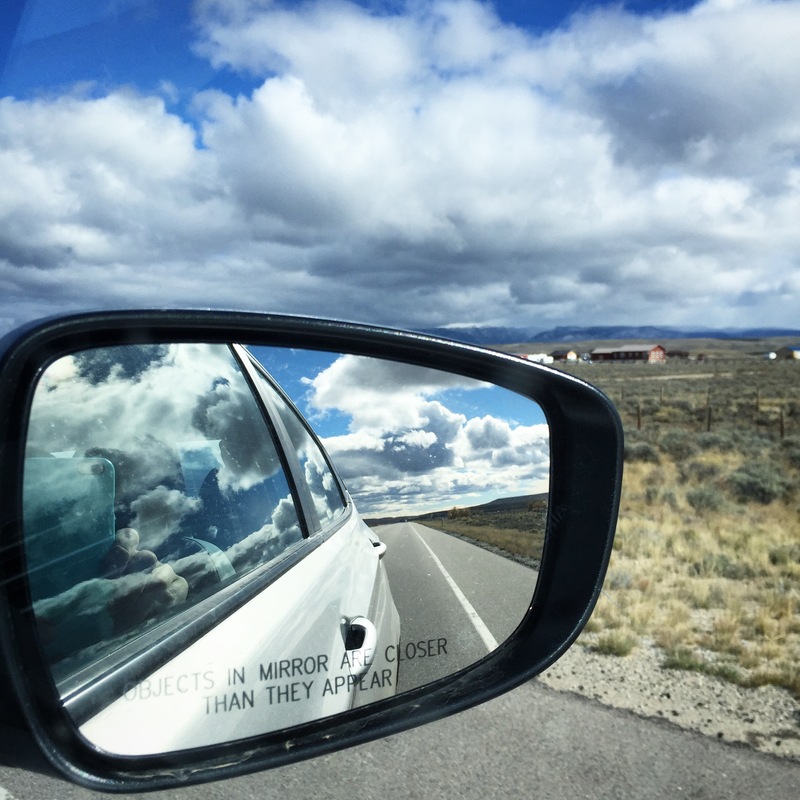 My phone found its way into the glove compartment, my feet perched up on the dashboard and I began to settle in. I remember the first time Andrew brought me to Green River Lakes years ago. 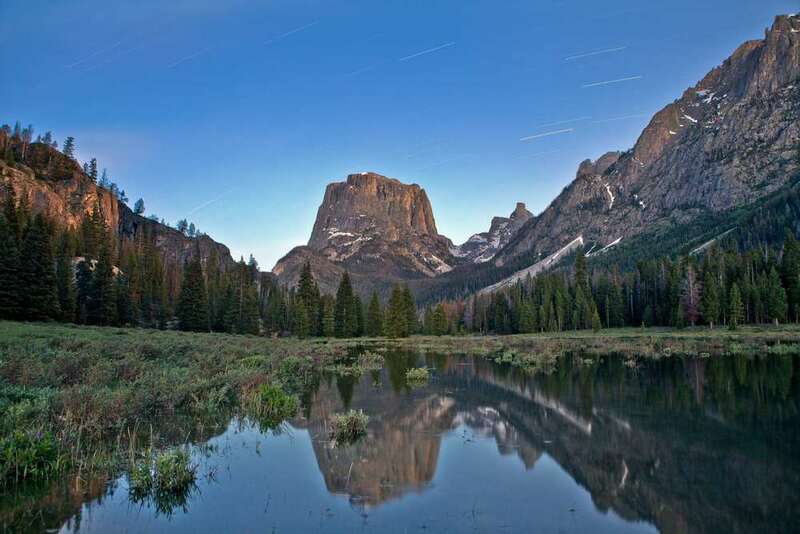 It’s part of the Wind River Mountain Range and home to Square Top. He had been going on and on about that dang mountain, almost as if it was an intimate friend. Needless to say, I knew when I saw him. And he sure is handsome. Square Top is a monolith of pure granite that looks as if it took part in some ancient Mountain Giant game. Who knows, it might have once been torn off of the Tetons, thrown across the sky and landed in the middle of the Green River Valley. We set up camp right on the river with a pristine view of our mighty monolith. Golden hills rolled into the distance making its way up the mountainside. The first night the moon was so bright we didn’t even need our headlamps. The next morning was clear and chilly. I’m the fire starter and Andrew is the barista. In that, he gets super grumpy without coffee and I get super whiny when I’m cold. It works well. Warm and caffeinated we took to the trails. The trail to the upper Green Lake is one of my absolute favorites. It’s easy goin’, forested, with small park breaks and beautiful stream crossings. The whole time I kept wishing my family could share in the experience. I could just see my niece running through the forest with her bouncy pigtails. We woke the next morning to a fog so heavy that we could barely see the river. I was getting over confident in my fire-starting skills and this morning it took me over 30 minutes and a LOT of wasted paper towels. With a fire finally roaring, the fog slowly starting to lift, I observed as the landscape revealed itself. Steam hovered gently over the river. Clouds reluctantly pulled away from the evergreen limbs. Beavers came out of their hiding places and paddled up the icy current. And I watched. It took almost a week in Wyoming and “No Service” before I could finally sit still. And I did. All day. My soul was restored that day. I didn’t realize the weight of my busyness until I sat still. The fog dissipated. The light moseyed across the mountainside. And I watched.